Of course, maybe Carney's memory could be jogged if the Whitehouse would allow the Benghazi witnesses and whistleblowers to come forward and testify to Congress without fear of losing their jobs...or worse. 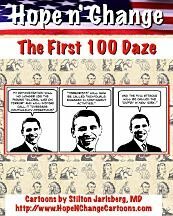 And speaking of people with memory impairment, it's worth mentioning that at Barack Hussein Obama's press conference this week, he asserted that putting prisoners in Guantanamo Bay had been an "emotional reaction" to those goshdarn 9/11 attacks but it needs to be closed because, "we are now over a decade out. We should be wiser." Sure, Barry. Ten years is a long time ago, right? Even though they're still finding pieces of aircraft wreckage in New York, near the desired site of the (presidentially praised) Ground Zero Mosque. And speaking of bloodthirsty, radical Islamics who would probably love us if we just gave them more hugs and government cash and put Sandra Fluke in a burkha, it seems that 30 of the FBI's 31 Most Wanted Terrorists are (surprise!) Muslims (and yes, the remaining terrorist is an environmental nut). Which makes it odd to the point of frigging stupidity that profiling is not being used to help identify terrorists before they kill in places like, oh, just picking a city at random here, EFFING BOSTON. Stranger still, considering these statistics, why is Homeland Security still railing about the dangers of potential terrorism from flag-waving, Constitution-loving, fiscal responsibility-type citizens...while simultaneously removing materials about radical Islamics from their counterterror training programs? It used to be that being a terrorist did not invite government sympathy and support, and being a patriot didn't invite government enmity. But, as Jay Carney would say, that was a long time ago. Okay, okay - Hope n' Change isn't getting any awards for subtlety today. 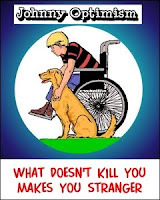 But when we read that taxpayers gifted the Tsarnaev family with $100,000 in free benefits and, in return, got a monstrous act of terrorism - we were appalled. And now, Dzhokhar Tsarnaev's team of taxpayer-funded defense lawyers has added attorney Judy Clarke, who previously helped the Unabomber, the Olympic bomber, and Tucson mass-shooter Jared Loughner all escape the death penalty. All of which makes Hope n' Change feel that ordinary, non-terrorist, non-government beneficiary type citizens aren't really getting the very best value for our tax dollars. We were going to say "bang for the buck" - but sadly, that's exactly what we got by funding the thieving, drug-using Tsarnaev family instead of shipping their jihad-loving asses out of the country when we had the chance. And say, what about the unsurprising news that Barack Obama has (according to nonpartisan and carefully weighted studies) spent twice as much time vacationing and golfing as he has working on the economy? Surely that little tidbit is worth the filling of an adult diaper or two - or would be if anyone outside of the conservative blogosphere even heard about it. We'd say more, but all of this talk about things that are highly absorbent has reminded us of one more which needs immediate attention. Our liver. Saturday night marked the annual comedy fest known as the White House Correspondents Dinner, at which politicians, alleged journalists, and the Hollywood elite gather to make jokes about how desperately effed up our country is. 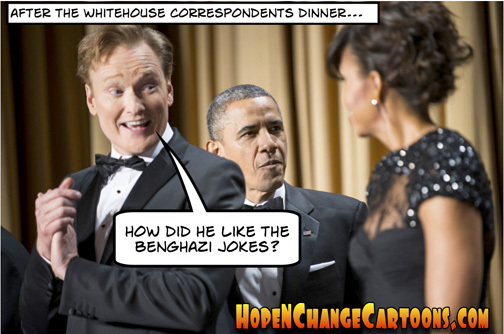 Sadly, the evening's emcee, Conan O'Brien, did not mention Benghazi while dishing out roast-style jokes (nor did anyone else). If Hope n' Change had a turn at the podium, we'd have said something like: "A lot of people were bugged that Obama sent out a self-serving publicity photo of his big Moment of Silence for the victims in Boston, but it's really not that big a deal. After all, he's been silent on the victims in Benghazi for seven months!" 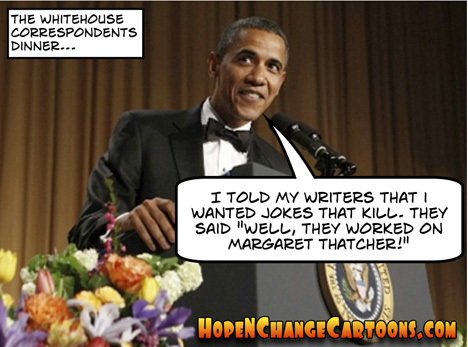 Obama himself told plenty of jokes because, after all, he can't stay sad about a little thing like a successful terrorist attack on American soil forever (especially after being feted by the feticidal folks at Planned Parenthood). He even joked about being Muslim, which is especially funny since his Administration (via Eric Holder) sent a Federal judge to stop the FBI questioning of the surviving Boston bomber, read him his Miranda rights, and assign him a legal defense team - thereby assuring that if there is a larger radical Islamic terror connection, the American people will never hear about it. Yeah, B. Hussein - this is a hilarious time to make Muslim jokes. Hope n' Change certainly understands the importance of humor in tough times, but the people who have created the problems, or are charged with solving them, shouldn't be doing the laughing because it's at our expense. Literally and figuratively. It shows that they don't take the problems seriously... and that, in itself, is a serious problem. As for the "journalists" who claim to represent the American people in finding and reporting the truth, they need to spend less time drinking champagne with politicians and celebrities, and more time learning how to get their hands dirty with something other than circle jerks. as the REAL dump Barry took on the late Lady Thatcher by snubbing her funeral.